The standard astronomers dream up huge amounts of heat needed to ionize noble gases. I guess they didn't teach them in undergraduate physics that noble gases can be very easily ionized with low amounts of electric energy (ie neon signs). Wow. I just read through all the pages of this thread. What a trip. I love thunderbolts forum! A crazy thought jumped into my head, when I came near the end. I thought, when we want a magnet, we just wrap some copper wires around a steel bar and send a current through the wire. Jupiter has Van Allen belts, just like the earth does. That is, major currents circling around the planet. Why are they looking for internal mechanisms for creation of planetary fields? Furthermore, if we place a steel ball in the magnetic field of our magnet, it becomes magnetic. Because Ganymede is in Jupiter's electric field, maybe that is why it has a field too. Happy Juno Year to us all! Here is the paper they talk about. I found this latest propaganda link from NASA for the Juno mission. Ridiculous. They present it as if it were the trailer of an upcoming movie. NASA can't convince me that NASA doesn't believe in the Electric Universe. They just don't want to be seen admitting it. NASA's Juno Spacecraft in Orbit Around Mighty Jupiter. The page has a time lapse video taken by Juno on approach, which shows the main moons' motions around Jupiter. And the next report from NASA. Juno apparently can't do a burn and operate a camera at the same time. and see if it is fit for public consumption. comingfrom wrote: Juno apparently can't do a burn and operate a camera at the same time. That is not it, they have to shut down because of the electrical environment of Jupiter, if everything is ON the sensitive equipment could burn out, even with the shielding present. But they are going to turn on the equipment sometime while they are there, in that electrical environment. Else why even get that close. And how sensitive is a camera? but do not understand not attempting to collect any data during that time. The excuse seems a bit lame to me. comingfrom wrote: Thank you, Daniel. The magnetoshpere is very big and has different densities, crossing boundaries can be dangerous, the craft is already providing data on the structure of the magnetosphere. For the link and the explanation. 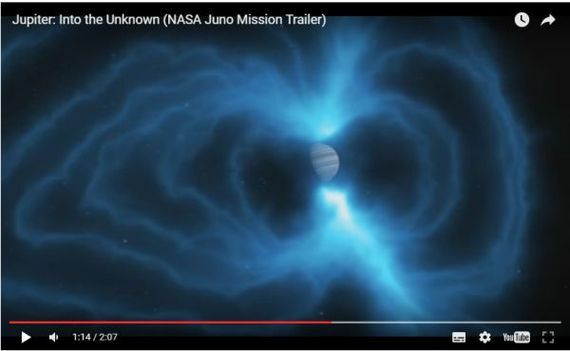 No one getting excited here that Juno might find a surface area here? I'm predicting a mean surface diameter of 32,000 - 69,500 km. And the 'metallic hydrogen' will turn out to be plain solid metal. I expect there is a rocky planet beneath the atmosphere. First close up pictures from Juno. Well, the latest image I can find from the Juno mission is dated 28th August - and nothing since. Not a sausage. I cannot but help wonder exactly what the cameras are revealing that NASA/ESA do not want us to know about (although I have my suspicions).